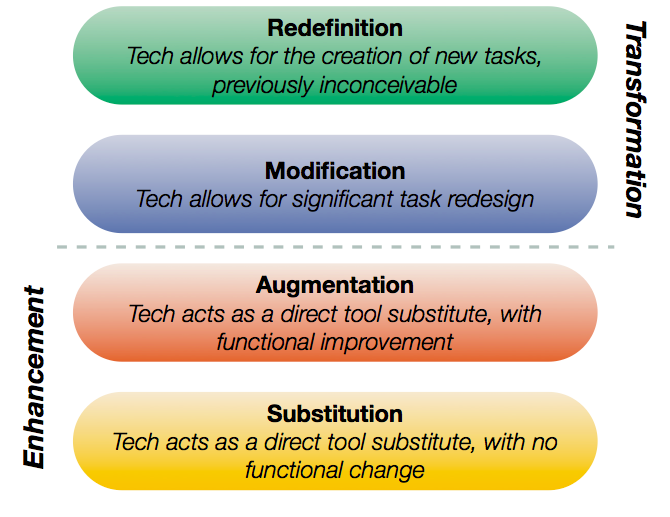 Image created by Dr. Ruben Puentedura, Ph.D.
SAMR, developed by Ruben Puentedura, is one model for examining the evolution of tech integration in classrooms. It focuses on the type of work students are doing and how much that work deviates from traditional classroom practices. In a sense, it measures the future against the past. This four minute video is great if you would like to hear him explain it in his own words. I like the SAMR model and I think it does what models are supposed to do, it get us talking and thinking about the work going on in our classrooms. This graphic shows the progression of a teacher's thinking with a bit of humor too. As a model though, I think SAMR has some issues we need to talk and think about more. This is my list of concerns. 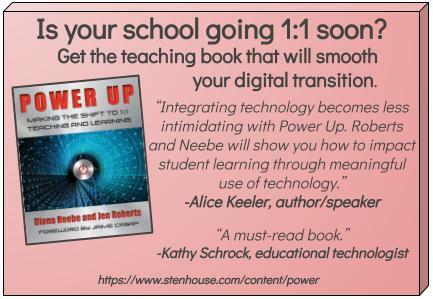 It privileges the modification and redefinition stages such that good teaching without tech is marginalized. Even after five years of 1:1 I still have a few fabulous lessons that just work better on paper. They are worth keeping even if they do not integrate technology. Teachers often underestimate the kinds of tasks that might qualify as redefinition. (I'm seeing this a lot lately and it worries me.) My friend Holly was tweeting about it from a keynote Dr. Puentedura gave in Boston a few weeks ago. The assumption by educators, (though the model does not specify this,) is that responsibility for task design still rests with the teacher, but in reality the classrooms that really reach redefinition are often rife with student driven innovation. 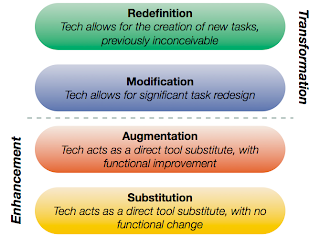 What if SAMR focused on students and teachers instead of tasks? Because models are good for making me think, I began thinking about SAMR with a focus on the people in the classroom, not just the task being done. I wondered what a progression might look like that moved from a traditional teacher-created tasks to student-centered, tech-integrated learning. This image above is the progression I came up with and it fit rather magically with the TECH acronym. (That's a sign right?) 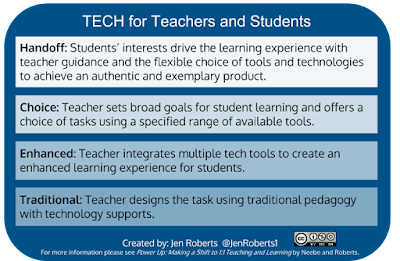 I tried to combine the technology progression of SAMR with a progression toward student centered learning. 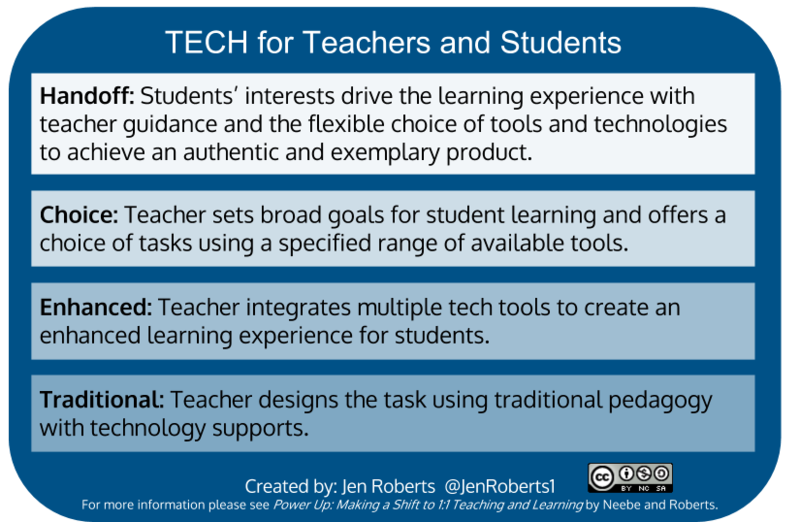 One thing I would add about both SAMR and TECH, is that none of these categories are exclusive. I think most of us spend most of our teaching time floating between the two middle categories of both models, occasionally hitting both higher and lower levels of pedagogy. I'm interested in your thoughts and suggestions. This is just a first draft of my thinking.